Just after 'Ripples In Our Lives' was published in October 2005, I had 14 hernias repaired then a mesh screen was placed over my entire abdomen. My health continued to decline over the years. I had my gall bladder removed in 2006 and prostate cancer surgery using cryogenic therapy in 2007. I have been in remission since then. Through the years to now, I have had many problems with pancreatitis and intestinal blockage resulting with a few more near death experiences. (I did not want to write another book.) In March of 2015 I had my left lower lob of my lung removed due to lung cancer and I am currently cancer FREE! In April of 2016 I had two stents put in my arties to my heart. At that time, I found out I have an enlarged heart due to high blood pressure for over 40 years. August 2016 I had cataract surgery. In March of 2017 I will have to have my optic nerve scraped to remove some particles that settled om them after the cataract surgery. I had 3 feet of my small intestine and 18 inches of my colon removed had a colostomy. I had to do something to help my digestive system because I am extremely overweight. So my daughter, Jackie introduced me to Plexus. They have products designed to help the digestive system, lose weight and promote a healthy life style. God needs some help keeping me alive. David Brundage experiences three near-death experiences and out-of-body experiences while in the hospital! During the first surgery, his heart stops as soon as the incision is made in his abdomen. The second surgery is done after the doctors check his heart out, which completes the original surgery. The third is after he gets an infection and eviscerates, requiring emergency surgery and a colostomy bag. If you would like a FREE copy of the book you may click on the PDF Button. It is a PDF file that you can open it in MSWord on your computer. If you have a PDF reader, it will automatically open. If you like what you read, you may donate your appreciation by using Paypal below. I am a 100% disabled Vietnam Veteran. Any donations for the book will be appreciated. Tommy and I are both Vietnam Vets. Please share this information EVERYWHERE TO MAKE IT GO VIRAL. Click Here For a direct paid Kindle Version you do not need a Kindle to read it just a computer. Tony is a man who had always taken the road less traveled in his lifelong quest to overcome what he believed were his failures as a youth. Tony dropped out of high school, joined the Air Force at the age of seventeen, rose through the enlisted ranks to the grade of Master Sergeant, and then through the officer ranks to the grade of Lieutenant Colonel. While he failed most of his classes in high school, at the urging of many people along the way, he went on to achieve a Bachelors Degree, and three Masters Degrees. After retiring, he taught elementary school for a few years before returning to his beloved Japan where he taught university for twelve years. It is the story of his adventures and misadventures along the way. If you would like a FREE copy of the book you may click on the PDF Button. It is a PDF files and you may open it in MSWord on your computer. If you have a PDF reader it will automatically open. If you like what you read you may donate your appreciation by using Paypal below. 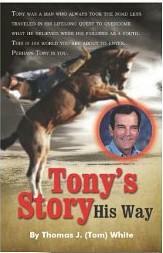 Tommy is Vietnam Veteran and retired military any donations for the book will be appreciated.